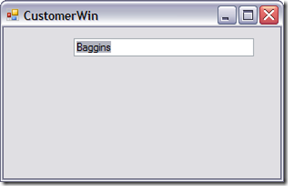 This is a continuation of the World’s Simplest AngularJS Example in Visual Studio post. 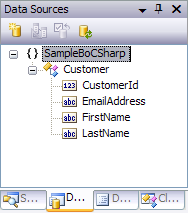 This post adds simple data binding to the example. 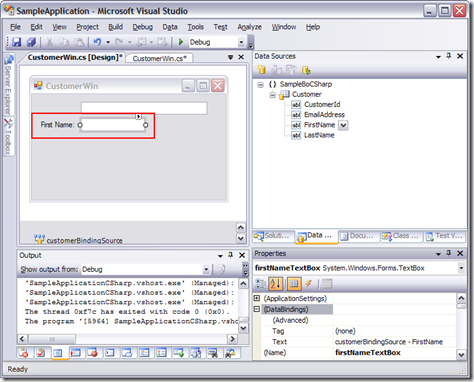 Most .NET developers understand data binding from Windows Forms, Web Forms, or XAML. 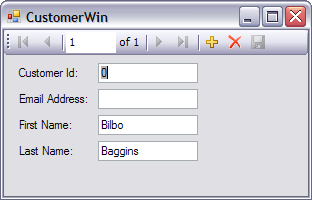 For example, in Windows Forms you can bind a LastNameTextbox control’s Text property to a LastName property of a Customer class (or LastName field in a data source). 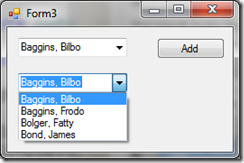 When the form displays, the Textbox is automatically populated. 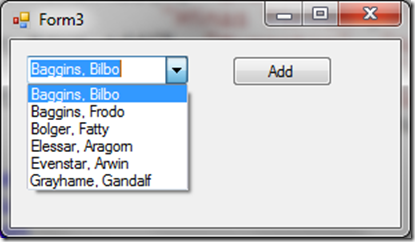 If the user changes the contents of the Textbox, the property (or field) is automatically updated. Angular provides this same type of two-way data binding. It automatically synchronizes HTML elements with data properties. The key to data binding with Angular is the ng-Model directive. The ng-Model directive binds HTML elements to a property. If no property exists, the property will be created implicitly. 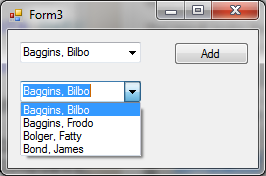 We’ll use that default functionality to perform data binding without any real properties for this simple example. 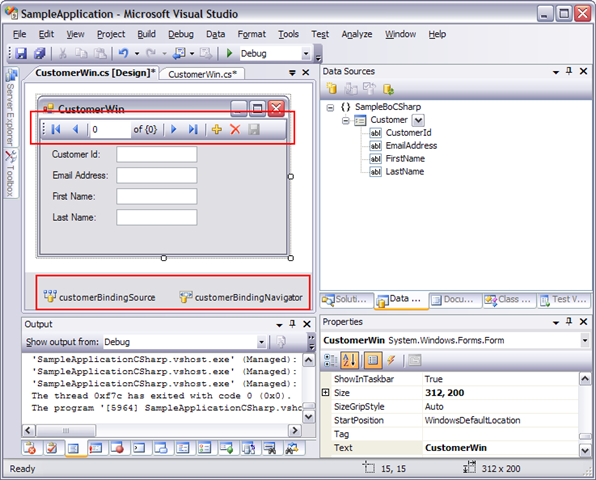 The above code sets the ng-model directive as an attribute on the input tag. 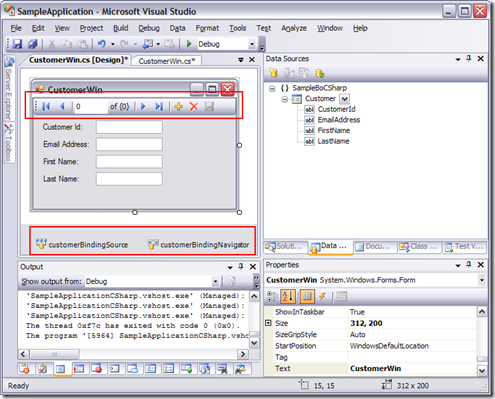 The value of the ng-model directive is the name of the property to which this input tag is bound. In this case, the property is named “customerName”. 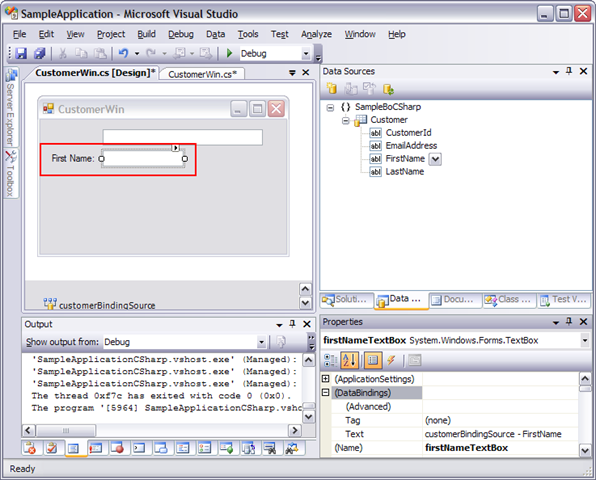 This binds the input tag to the defined property. 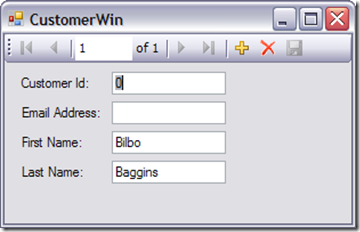 As the user types into the input box, the customerName property is automatically updated. This property is not defined anywhere, so Angular creates it implicitly. The div tag displays the value of the property by including it in double curly braces. Double-curly braces define a “binding” and can contain any Angular expression. In this case, the expression is just the property name. So the value of the property will appear where the binding is defined. As the user enters text into the input box, that text is immediately displayed in the div tag. We’ll see lots more about binding once we connect to some data. 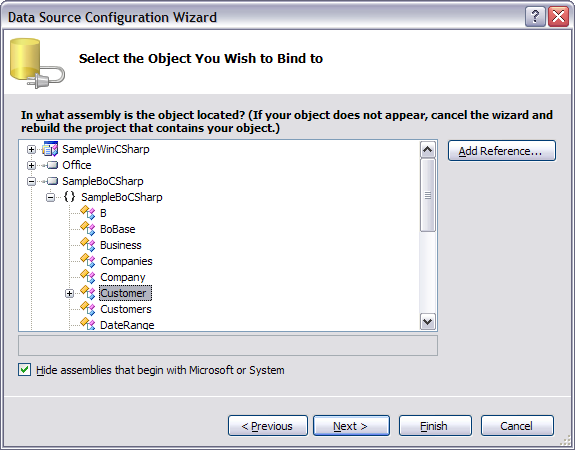 Some of the collections in the Microsoft Office object models implement IEnumerable. The IEnumerable interface provides the ability to perform a for/each against the collection. 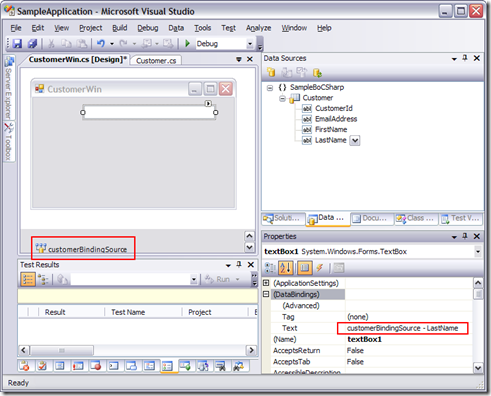 With .NET 3.5, a Cast extension method of IEnumerable allows you to work with these collections using Linq. 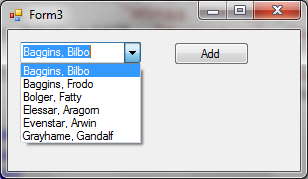 For example, say you want to bind the set of open Word document names in a ComboBox. First, set a reference to the desired version of the Microsoft Word Object Library from the COM tab of the Add Reference dialog. The resulting reference appears as Microsoft.Office.Interop.Word. 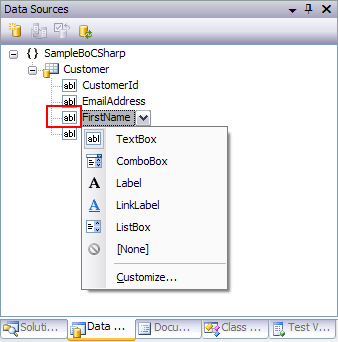 // Use Linq to access the document names. 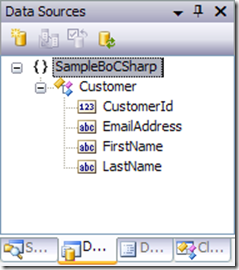 ‘ Use Linq to access the document names. 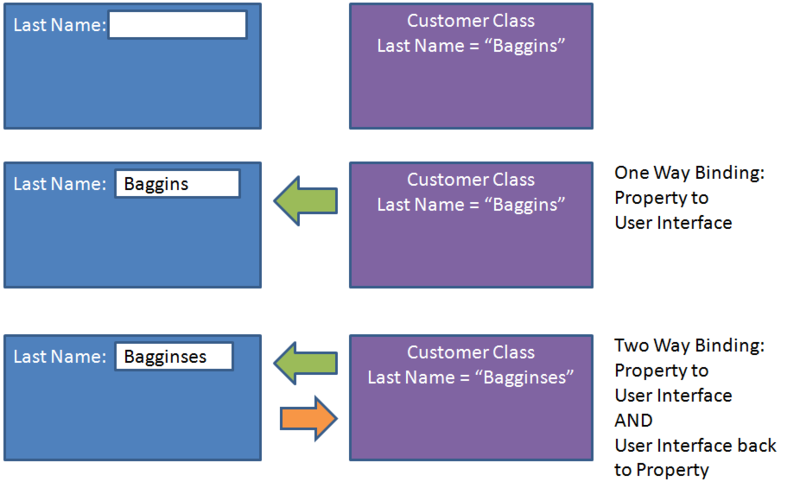 In both of these examples, the code starts Word, creates two Word documents, uses either Linq or a Lambda expression to define a query and then binds the resulting set of document names to a Combo Box. 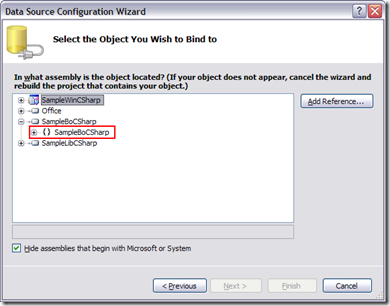 Notice the missingValue variable in the C# code that is not in the VB code. 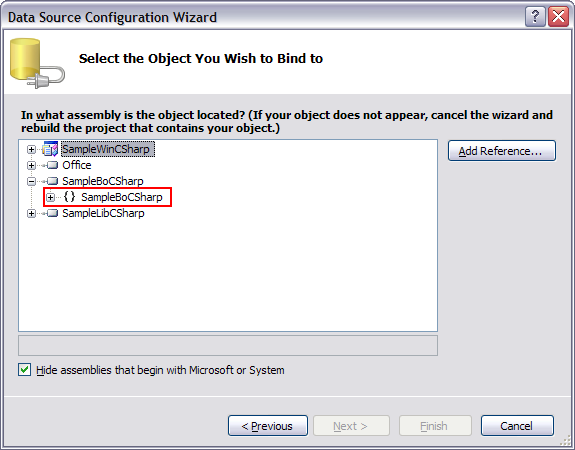 VB supports default parameters, but C# does not. 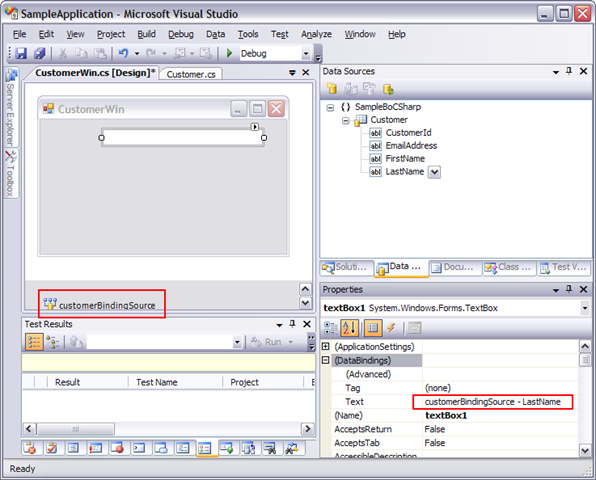 So any time a parameter is defined for a Word method, C# must provide it. 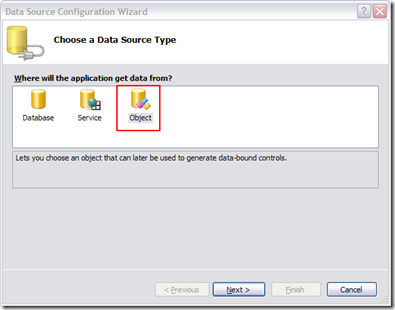 VB will use the default parameter values. NOTE: A new feature in C# 4.0 (Visual Studio 2010) allows for default parameters in C# as well, dramatically simplifying the C# code that interacts with Word or Excel. As another example, the following code retrieves all of the words from the defined Word document. This code retrieves all of the words in the document defined by the doc variable. 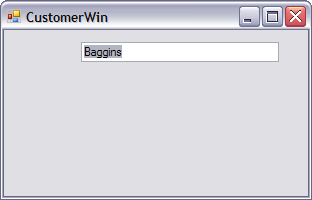 Instead of selecting the list of words, you could use any Linq feature such as finding only a specific set of words that match a criteria or counting the number of occurrences of a given word. This technique works with Excel as well. Say you want to bind the list of spreadsheets in an Excel workbook. 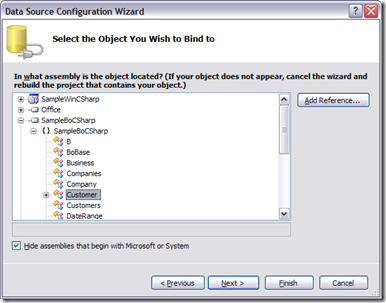 First, set a reference to the desired version of the Microsoft Excel Object Library from the COM tab of the Add Reference dialog. The resulting reference appears as Microsoft.Office.Interop.Excel. 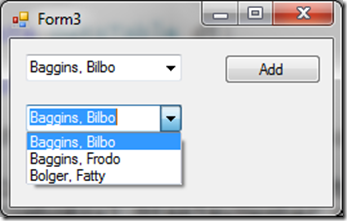 // Use Linq to access the spreadsheet names. // Or use Lambda expressions. 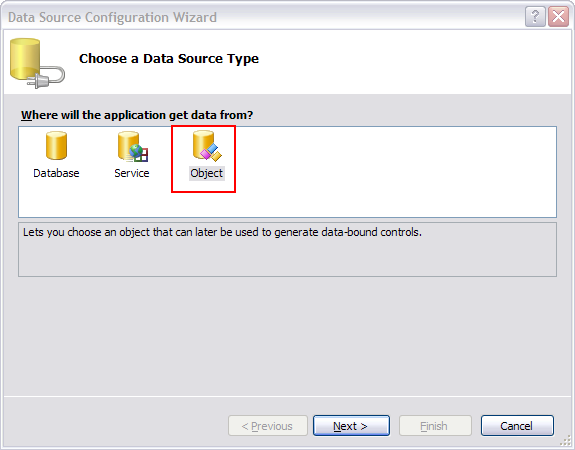 ‘ Start Excel and get Application object. ‘ Get a new workbook. 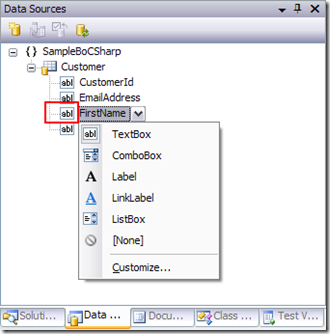 ‘ Use Linq to access the spreadsheet names. 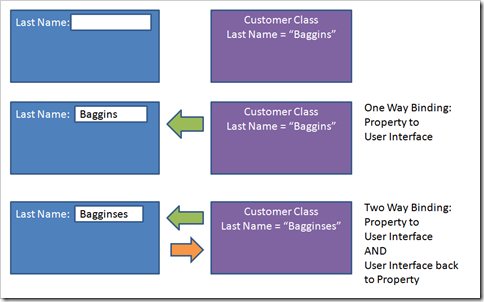 In both examples, the code starts Excel, changes the name of the active sheet, uses either Linq or a Lambda expression to define a query and then binds the resulting set of sheet names to a Combo Box. EDITED 11/16/09: Added information on setting the appropriate reference. My prior post demonstrated how to bind to a list of month names. Once the user picks the desired month, you may want to provide a list of valid dates to pick a date in that month. For example: 1-30 for September and 1-31 for July. You can accomplish this using a switch statement (Select Case in VB), but that hard-codes the dates, does not handle leap year, and does not support localization. Another option is to use the culture specific calendar as shown below. This function first defines the calendar based on the current culture. It then uses the calendar’s GetDaysInMonth method to get the appropriate number of days in the month. It then uses the Range method of Enumerable to build a list of numbers from 1 to the number of days in the month and returns it as a list of integers. Visual Studio comes with DateTimePicker and MonthCalendar controls that provide a standard looking calendar for the user to pick a date. But there are times when these controls don’t provide the features you need. There is an easy way to achieve this. This code gets the month names based on the current culture. This ensures that you get the correct localized names. You can then bind the array to a ComboBox or ListBox. NOTE: In both cases, be sure to set a reference and import System.Globalization. When looking at the list from the US (and most countries), there is a problem. There appears to be room for 13 values in the list. This is for those countries that have 13 months, such as Ethiopia. So for most countries, there is a blank entry at the bottom of the list when it is bound. There are numerous ways of removing the empty entry. Even though it might not be the most performant, I like lambda expressions, so here is one way to remove the empty entry.